a kinship with the former king of Aranyaprathet. In addition, Master James Kemthong also studied autobiographies of notable priests in Thailand who understood the mystics, most of which had been collected in his father books such as The prestige priest of Chainat “ Luang Pu Sook Kesaro” , The famous priest of Wat Natangnok krung khao Ayuttaya “Luang Pu Jong Puttasaro”. Even biographies of the secular sorcerers, for example “Master Fon Deesawang” ; the secular sorcerer of Khao-aor bureau in Puttalung, Pol.Maj.Gen (Police Major General) Koon Puntarak-rachadetch; the follower of Khao-aor bureau who was named “strengthen sodier” Buster knight of Police Department and Mastes Heng Priwan. These are all inspiring to be Yantra Master. Moreover, Master James Kemthong had the opportunity to find the preaching researched religion profound causes and effects by Buddhadasa Bhikkhu. Buddhadasa Bhikkhu sincerely believes that world peace is possible, if humanity would only conquer the selfishness which is the cause of all our conflicts and troubles. Moreover, he insists that the world's religions are the most important vehicles for propagating unselfishness. Master James Kemthong accomplished this research and speak to himself. "Life will find a chance to get to the Mokkhaplaram Religion Practice Garden or Suan Mokkh to worship Buddhadasa Bhikkhu." The opportunity had come, he was driving a car south toward the Mokkhaplaram Religion Practice Garden immediately. He walked around when he arrived toward the Mokkhaplaram Religion Practice Garden, then there were people in the area told him that Buddhadasa Bhikkhu had passed away several years ago If he would like to worship the ashes of Buddhadasa Bhikkhu, he should go to Khao Yai Somprasong(Moutain), Tachana in Suratthani where was packed some part of Buddhadasa Bhikkhu bone ash. When he heard it, then drove away heading into the Khao Yai Somprasong(Moutain) immediately. When he reached, the car park down the hill, looked at the cave entrance in the peak of the moutain, suddenly thought it was very steep, distance to the peak more than three hundred meters. He had tried to walk up the slope of mountain, had been climbing rocks and twig until to the cave entrance. He looked around the cave area, there were many stupas containing bones ash of ancesters lined up around the cave and there were a lot of Buddha. He had to worship Buddha and walked around the back to get through cave. Suddenly fireball red beads glittering charged the Master and circling around his head. He has sat down, closed his eyes and meditated when mental fall into a state of calm reverie, the mind becomes calmer, stronger, more whole and balanced. This enhances the quality of thought, making it more profound and open to inspiration, while providing great clarity of mind - albeit in an altered state of consciousness. A deeply relaxed physical body with a clear mind holds this connected trance state longer than would naturally occur.Then he brought himself back to reality the tablets fireball red light has gone out so he worshiped to guardian angels who protected that place and kept walking. This tract embraces the mouth of the cave, considering the stone inscription “King Taksin, the great king of Thailand had come to this place”. In addition, Villagers in the area have told him that this place It used to be cut and hit remade in ancient times already. Master James Kemthong walked out from the cave, There are many wild monkeys jumping on the trapeze tree branches followed him down While walking down the wind was blowing from behind along the way but the wind blew only walkway, trees on both sides of the perennial unmoved yet. When he went down near the car park he turned to the way he down also the wind was blowing on the face and body but trees intact unmoved. It was a strange and amazing so he had felt that would be the souls of ancestors contained in the cave pagoda as surely sent him down or maybe it's the wild thee , neither shall be guardian angels blessed for him. Master James Kemthong asked to be a student of the Buddhist saint “Phra Ajaan Mun Bhuridatta Mahathera” who was responsible for the establishment of the forest ascetic tradition. Most of his teachings :the students whose lives were profoundly shaped by the experience of living and practicing meditation under his guidance in Wat Suddhavasa, Sakon Nakhorn. Another Master James Kemthong’s teacher was Phra Ajaan Sing Siriwanno :Buddhist saint who criticizes the divine mercy and the abbort of Phu Tam Prawiharn, Ban Kaeng sub-district, Na Kae district, Sakon Nakhorn province. 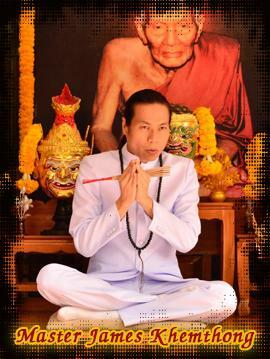 Master James Kemthong, a secular faith in the science of Yantra Tattooing, inherited traditional tattoos which reflected culture, faith,belief in sorcery and the rites of Thailand .Yantra tattoos are believed to be magic and bestow mystical powers, protection, or good luckThere are three main effects of a Yantra tattoo. One is that which benefits the wearer, such as making them more eloquent. Another is that of protection and to ward off evil and hardship. This is commonly used by military personnel, police, taxi drivers, gangsters and others in perceived dangerous professions. Another type is that which affects people around the wearer, such as invoking fear. The tattoo only confers its powers so long as the bearer observes certain rules and taboos, such as abstaining from a certain type of food. From the broadcast family trough Master James Kemthong so he has experienced in the Yantra tattooing untill now the current objective is to be determined by nurture Buddhism,help those in distress and spread Buddhism worldwide by adhering to the teachings of Lord Buddha. Master James Kemthong :The act of magic par excellence is that of God's verbal fiat who focusing on The four cardinal virtues principles, no matter where he got a reputation dubbed and rumor around. Master James Kemthong wishes to take an oath which is a religious commitment, Obstacles make him stronger and living as a tiger, The Tiger that is not asking anyone to eat meat. He believes in quote “Where is gold , whether it is gold”. The first time he did a Sakyan workshop was up in Chai Ya district,Suratthani province . Miracle happened in first tattoo, It is apparent that the local in area and his followers spoke with one voice “The angels in this place would surely bless for Master James Kemthong” so the first needle of Yantra cause to miracle, dark hazy sky turned to brighter. It was amazed in the villagers and all the disciples who attended in Sakyan. After that the name of Master James Kemthong has spread more widely continuous and with many experiences in Sakyan so Master james was regarded as an expert in Sakyan or traditional tattooing and made a large number of disciples.